Any goofy pundit can make annual predictions at the New Year and then escape accountability for his foresight failures because everyone forgets them, but the real challenge is making predictions right after Thanksgiving for the rest of the year. That’s living on the edge. And in an era when things change on a dime – Trump tweeted! Democrat got handsy! Idiots are kneeling again! – a month can seem like a year. So, Democrats, since months seem like years to you these days, that means we have over 37 years of President Donald J. Trump left, plus another 48 more years after he crushes Crusty Commie Bernie or Her Chardonnayness in 2020. Go on, Felonia Milhous von Pantsuit, drink up. Anyway, here are my predictions for the rest of 2017! With the defenders of Bob Menendez, Al Franken, and John Conyers all doing the “Hey, sure, sexual abuse is bad, but let’s not get kooky about it, and also all the women, who we should totally believe, are all lying or delusional” thing, what do you think the people of Alabama are going to do? What do you think their thought process will be? Moore’s totally going to win, but the more interesting question is whether the Democrats, the GOPe, and the mainstream media will take a personal inventory and think about their role in electing Roy Moore. Nah, it’s much easier, and so much more self-satisfying, for urban elites to pretend that the people of Alabama are a bunch of pro-pedo freaks than to consider that they actually don’t believe the charges, in large part because they don’t trust their establishment and media betters. 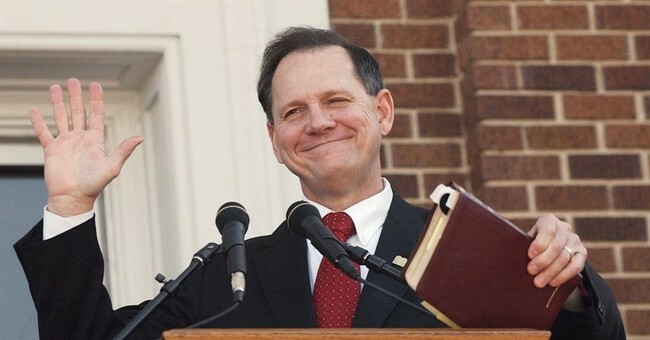 Oh, and it’s easier to pretend that Alabamians don’t see the incredible hypocrisy being rubbed in their face by people who protect their admittedly guilty establishment fellow travelers while demanding that these red staters submit to years of representation by an ardent leftist based on hotly disputed claims. On the upside, as a blue state lawyer, I’m going to save tens of thousands thanks to these idiots’ showboating while their constituents keep getting socked in the gut. Way to go, jerks. Who said this is a “do nothing” Congress? Well, we’re certain to see them move heaven and earth to keep people who shouldn’t even be here here. And their immediate families. And their extended families. And everyone who ever met a member of their extended families. Because letting illegal aliens not just stay but giving them citizenship so they can vote for liberal Democrats, and paving the way for millions of other people to chain migrate in with them and also get citizenship so they can vote for liberal Democrats too, is totally absolutely what the Republican base sent its elected representatives to Congress to do. But don’t worry, the GOP knows how to make deals. It will totally get some cool concessions in return, like the promise to maybe possibly think about perhaps asking politely that people not come here illegally anymore, unless they really want to, in which case we will give them all food stamps and a new Buick and citizenship so they can vote for liberal Democrats. Sasse will vote for tax reform only because he has to run again in Nebraska, but that won’t stop him from mouthing off with his “more in sorrow than in anger” act whenever a conservative actually fights back. Not rolling over is unseemly, doncha know. Mocking a liberal who faked being an Indian to score a job? Oh, well, I never! Recently, General Flynn’s lawyers allegedly ending the mutual defense agreement with other lawyers was seen as Flynn “cooperating” with Mueller. And…nothing. Russian collusion has morphed into a Turkish movie deal. Next, some other tea leaf is going to get read as proof of the Trumpocalyse and…nothing. See, there’s this giant problem that all the lunatics who are certain Trump is a hop, skip, and a jump from being put in shackles by the Grand Marshall of the FISA Court: He didn’t collude with the Russians. Yeah, that prediction was almost too easy.